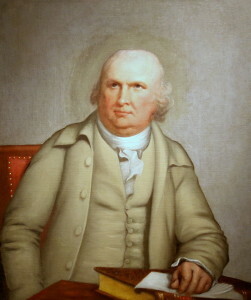 Born in England, Morris immigrated to Maryland in 1747 then moved to Philadelphia, where he became a prominent merchant. Active in the American Revolution as vice president of the Pennsylvania Committee of Safety (1775-1776) and a delegate to the Continental Congress (1775–1778) and the Pennsylvania legislature (1778–1779, 1780–1781, 1785–1786), Morris was the primary manager of finance for the war effort from 1776 to 1778. Later, he worked as a fund raiser, requisitioning cash from the states and borrowing from the French. In 1781, he founded the Bank of North America and was superintendent of finance under the Articles of Confederation from 1781 to 1784. Ironically, his personal finances suffered toward the end of his life, and from 1799 to 1801 he was incarcerated in debtors’ prison.